Are you searching for new travel destinations to satisfy your wanderlust? We cannot promise that Zakynthos in Greece will be a trip entirely off the beaten path or that there will be no tourists in the island -even when it is not peak season-, but it certainly is a lesser known spot in the Greek Archipelago offering unique views and hidden landscapes preserving its own peculiar charm right by the Ionian Sea. 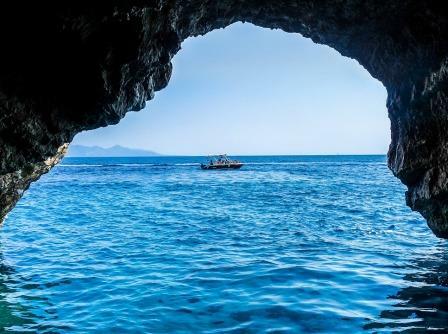 In order to reach this piece of paradise, travellers book scheduled flights with Aegean Airlines, Sky Express or Olympic Air, which operate all year round from Athens airport and Corfu, or else commute by ferry boat to Zakynthos from Kyllini port, the only terminal from which this service runs. It must be said, though, that even when these two options are the most commonly used, others prefer to fly directly from its origin airport in Europe thanks to the seasonal operations carried out by airlines like TUI, Thomas Cook, Jet2.com, Easyjet, Condor or the charter Blue Air. Continue reading to learn further about the several ways to travel to Zakynthos and find accommodation for your holiday in Greece. Which airport is closest to Zakynthos island? Contrary to what many might think, Zakynthos has its own international airport (ZTH), located less than five kilometres away from the town centre while also close to Tsilivi, Laganas and the popular Kalamaki beach. Its passenger terminal welcomes visitors flying from Athens airport or Corfu all throughout the year and those arriving aboard international flights from the main European cities during the holiday season. Austrian Airlines (from Vienna), Blue Air Charter (Bucharest), British Airways (London Heathrow), Brussels Airlines (Brussels airport), Condor (Düsseldorf, Frankfurt, Hamburg, Munich and Stuttgart), Easyjet (Bristol, London Gatwick, London Stansted, Liverpool and Milano Malpensa), Finnair (Helsinki), Jet2.com (Birmingham, East Midlands, Edinburgh, Glasgow and Manchester), Swiss International (Geneva), Thomas Cook (Cardiff and Newcastle), Transavia (Amsterdam and Eindhoven), Travel Service Polska (Warsaw Chopin and Katowice) and TUI (Copenhagen, Oslo and Stockholm Arlanda). If you are already in Greece and would like to incorporate a visit the to island as an additional stop along your tour, know that it is possible to fly directly from Athens airport to Zakynthos in just 45 minutes, regardless of the month of the year chosen for your trip. Aegean Airlines, Olympic Air and Sky Express are in charge of operating this route all year round. You may also fly from Corfu to Zakynthos with Sky Express. Ferry boats to Zakynthos depart from Kyllini port between three and seven times a day and completing this journey does not take longer than one hour. However, the trip must be planned in advance as it is mandatory to travel to Kyllini first, the only port from which this ferry route is operated. To arrive, rely on the KTEL bus company or ask for information in Athens airport, where bus shuttles depart towards either Pyrgos or directly to Kyllini. When planning for your holiday in Greece, consider the varied array of lodging options available. For ideas and inspiration, we advise you to take a look at our recommended villas, hotels and budget accommodation in Zakynthos island below. At the Villaggio Studios and Apartments, travellers may choose to stay in either a studio or a two-bedroom fully-equipped apartment, which makes it perfect for those travelling in a group who wish to feel like at home while away. This establishment, exceptionally situated within short walking distance of the beach and affording beautiful garden and sea views, is run by a family who pays special attention to ensure that each and every need is taken care of. Besides, guests won’t miss anything having several convenience stores and taverns (the local restaurants) all around, as well as the possibility to drive to and from Zakynthos airport (14 kilometres away) and the town centre (12 kilometres away) any time, leaving their car in a secured parking spot at the facilities. At this accommodation in Zakynthos, Greece, the apartments feature free WiFi, private balcony, air conditioning, TV, coffee maker, bathroom and a kitchenette with appliances where they can use local products provided by the hosts to cook breakfast daily. This accommodation in Greece is superbly located in the area known as Agia Marina, thus boasting stunning mountain views and inviting guests to enjoy their spare time in the garden or organise a barbeque outdoors. The two-bedroom apartment put at the guests’ disposal in Katerina’s guest house can accommodate up to five people at oonce. Aside from the complimentary WiFi internet network accessible all throughout the premises, travellers who have chosen this accommodation in Zakynthos particularly liked the freedom of cooking their own meals in the kitchen any time of the day or night, and also other amenities which made their stay abroad easier, like the availability of a washing machine for them to use. This hospitality establishment in Greece provides free airport shuttle transfers to confirmed guests, along with top-notch customer service metres away from Tsilivi town and its beaches, and about five kilometres from Zakynthos city centre. Furthermore, in addition to the stunning mountain or sea views afforded from its ample units with balcony, travellers are invited to enjoy a hearty daily breakfast in the open air on a terrace overlooking the ocean. The Balcony Hotel in Zakynthos has free WiFi accessible throughout its communal zones and rooms, suites and apartments, which are air-conditioned and feature a mini fridge, TV, en suite bathroom and, in some cases, a kitchenette. Would you like to find out how to travel to other archipelagos in Greece? Read our post about airlines flying from Athens airport to the Greek Islands.